Not even spam filters can save Fast Company writers from horrible PR pitches. Here are 3 tips on how you can use social media to win hearts, minds–and ink. Every day I immediately delete about 20 percent of the messages in my inbox. Historically, the emails I trashed were mostly relegated to Nigerian scams and requests for cash from someone “unable to access” his pending inheritance. Fortunately, Gmail spam filters have helped to abolish most of these. Unfortunately, these same filters can do nothing for the endless stream of PR pitches that assault my inbox that are often irrelevant, impersonal, and, dare I say it, lazy. The laziness is especially damning in the age of social media. Never before have PR professionals had such an enormous opportunity to custom tailor pitches to journalists, bloggers, and content creators, who are most likely flocking to sharing sites online. With a few minutes of simple due diligence on a pitch recipient, which means dipping into Facebook, Twitter, and LinkedIn, an email message is easily customizable to become more relevant and personal (i.e. PR professionals can suggest the media platform that might be a good fit for the story, and why the story is a good fit for the reporter). For example, within minutes of browsing Fast Company reporter Austin Carr’s Twitter feed (@AustinCarr), I have a solid sense of what magazine he works for (Fast Company), what industries he covers (tech, tech, and more tech), and what approach he often takes. This effort takes less than five minutes, and yet you wouldn’t know it from the pitches he gets, a number of which have cited his work for “Fast Car” magazine and suggest stories in the automotive industry. (Or this gem from yesterday: “Dear Austin, As a long-time media expert and author, I can say firmly that President Obama is a great orator, but the worst president I’ve ever seen when it comes to explaining his plans and achievements. If you want to discuss this more fully, please let me know.” At least they got his name right?). I would hope that a PR professional would take the time to search my social streams online, but it is the exception rather than the rule. While social media does offer a PR professional a better opportunity to custom tailor a pitch, these same online tools can be the death of a pitch if the recipient deems that said pitch deserves a good dose of social ridicule. I’m not simply talking about the pitch making its way to a “bad pitch” blog, but instead winding its way through the social sphere. Just recently, after deleting a slew of irrelevant pitches, I stared down the following message from a well-known public relations agency. While I didn’t want to call out the agency in question, the pitch was so impersonal that I couldn’t help but share it on Facebook. Are you in a constant battle with your technology? We’re talking anything from mobile phones to your car GPS system to even your microwave timer! We’ve all had technology snafus, and now’s your chance to (literally) fight off these breakdowns. With more than a decade of experience reporting on the latest trends in technology, I wasn’t sure if I should laugh or cry at the suggestion that I can’t operate my own microwave, but I knew that I did want to share this pitch online. So instead of a bad pitch going to one person, it is seen by thousands. And instead of a positive story about whatever you’re pitching being seen by thousands or millions, your brand gets thrown under the bus for the sake of comedy. For PR professionals wondering how to leverage social media instead of bearing its wrath, here are a few simple tips. 1. Do your social search homework. Each and every time you send a pitch, research the recipient across major social media sites, study their profile, and understand what and how they share. I’ve received pitches for TV shows I no longer host and blogs I no longer write, which could have been avoided if the PR professionals did their homework. 2. 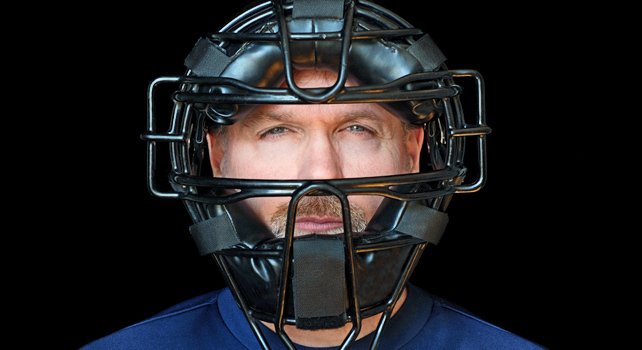 Consider a social pitch first. There are many writers, myself included, who spend more time on services like Twitter than in their inbox. In other words, there are times when a quick intro and pitch on Twitter, Facebook, or LinkedIn is the best way to reach out. Starting conversations–rather than just relentlessly pitching stories–on social streams can help you establish relationships with writers you’d like to cover your stories, which may make them more open to future pitches. This is especially true if you don’t have an actual story to pitch–the fact that your company exists or your CEO will be in town does not a story make. Delete. Fast Company executive editor Noah Robischon recently got a thoughtful Twitter video pitch that shows how to do it right (he took the meeting). You can also monitor journalists’ social streams, where they often turn if they are seeking information or new sources. If a media contact is interested, an email message can act as a follow-up. 3. Kill the “Dear journalist” form letters and mass emails. We live in the age of connections and relationships, thanks to so many tightly integrated social media networks. The generic PR pitch is the antithesis of what good communicators practice today–not to mention that most writers are looking for a something exclusive, not the same thing that just landed in thousands of other inboxes all across the land. While a press release is often a necessity to disseminate information, a personal note right off the top of any correspondence is critical. If not, the only place your pitch is going is to the trash, along with the other 20 percent. 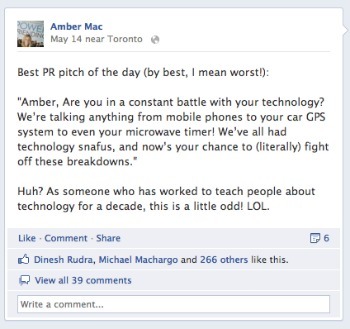 Got a PR pet peeve, or want to share the worst pitch you’ve ever seen? Tell us about it in the comments.